This week’s MCN has a free 16-page guide to the best lids you can buy and we’ve also got £3000 worth of helmets to give away. Whether it’s an AGV, Arai, FM, Shoei, Suomy or X-Lite you’re after, you’ll find information on price, colours and features on 100 lids. You could even win the lid of your dreams in our easy-to-enter competition. 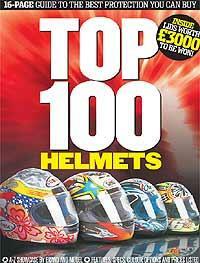 Simply look at the back of the supplement at the list of 18 helmets worth between £100 and £350. Choose the one you want, and you could get a new lid for nothing. Cagiva’s UK comeback, new MV’s will arrive, £235,000 Honda classic GP bike replicas, new Heretic cruiser uses race-spec equipment, MCN/Harley Centenary party, Police helicopter crackdown, V-twin Voxan range revived. Morini developing 650 and 750 sports bikes, radical new British lid design, 70mph in the hard shoulder? Adam Duckworth, Kevin Ash, save more than £453 with the information in Insider, Be an expert on the Yamaha XJ900, Any Ibbott’s riding tip, WP suspension for the 2003 Honda CBR600RR, New Ixon leathers, Alpinestars SMX Plus abused, and win Motrax top block protectors. Tuned Suzuki GSX-R1000 takes on the standard model, Long-term test reports on the Yamaha Fazer1000 and Yamaha R6, Aprilia Pegaso Tuscany-Tibet, World first comparison test; Triumph Daytona 600 vs Honda CBR600RR, MCN’s What’s On guide, Entry forms for the MCN Summer Sports Bike Show Special of the Year and Dyno Shootout, Jerez MotoGP new and reports, Michael Scott, Colin Edwards writes for MCN, twin-shock Yamaha M1 axed, MCN speaks to MotoGP hopeful Chris Burns, the art of slipstreaming, North West 200, Annual US vs UK Air Wars freestyle MX, Yamaha WR450 road kit, Which is the best Supermoto? Honda HM450F Motard, CCM R30, KTM LC4 650SM?